Toast. Just a slice of lovely, crispy on the outside -- sometimes fluffy on the inside -- goodness. While there are an unlimited number of ways to dress up your toast in the morning, sometimes I find that the simplest approaches are the most preferred -- especially by kids. With Halloween right around the corner, I've been experimenting with a bunch of new pumpkin recipes. Pumpkin butter is one of my fall favorites, so one morning after making my first batch of the season, I took a heaping spoonful and dolloped it on top of a warm slice of just-out-of-the-toaster crusty deliciousness. With the back of the spoon I quickly fashioned the pumpkin butter into a pumpkin shape, which was enough to get my kids excited. Don't judge me too harshly for then grabbing a bag of chocolate chips at 7_30am to make the Jack O'Lantern face. I couldn't help myself. You can easily substitute raisins for the chocolate, but what's Halloween without some sweets? 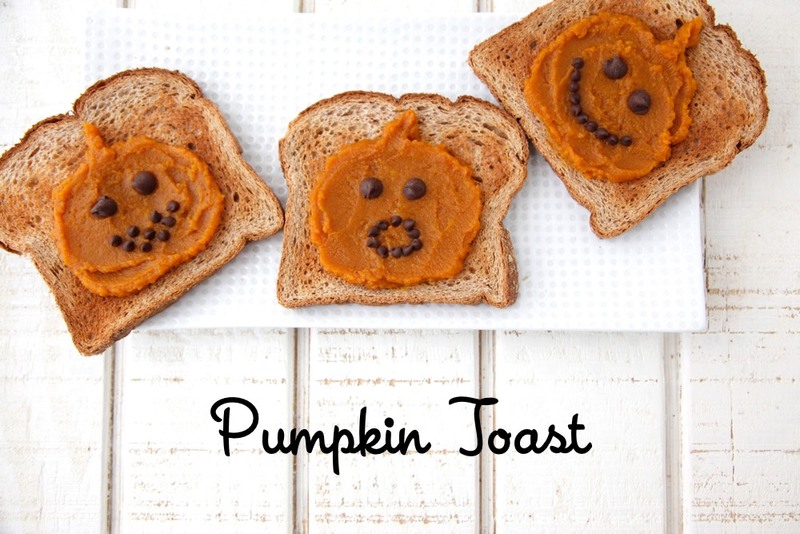 This easy to make yet heartwarming pumpkin toast morning treat should get everyone's morning started off right. 1. Place the bread slices in a toaster and toast until golden brown. 2. 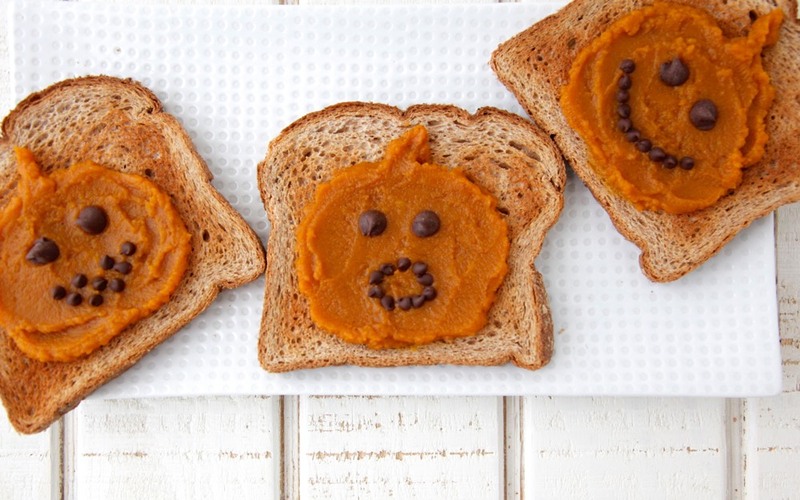 Spread 2 tablespoons of pumpkin butter onto each slice of bread in the shape of a pumpkin. 3. Use chocolate chips to decorate eyes and a mouth to resemble a jack-o-lantern. Um, could these be cuter? I sort of want me make myself a few for an afternoon snack! These are so cute and I'm kind of crazy for TJ's pumpkin butter, although I could just make my own but whateves.